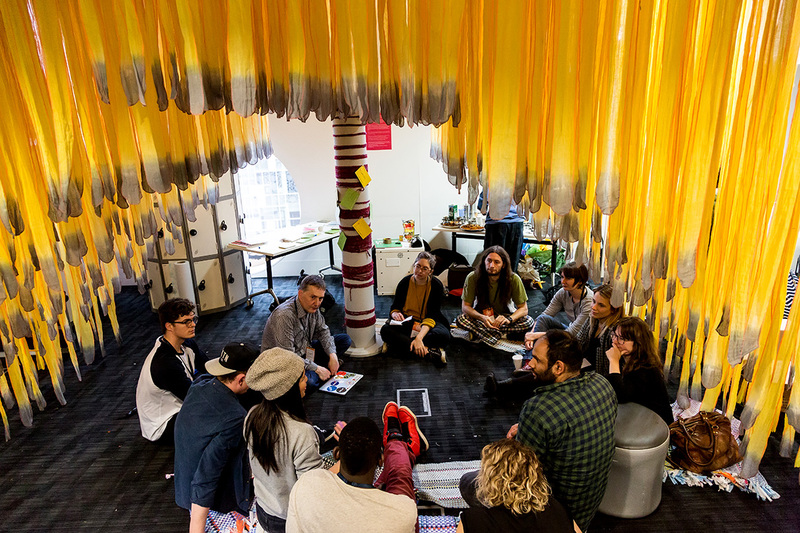 At Mozfest 2015, Jon Rogers of Dundee University curated The Global Village with the intent of giving a combined home to the festivals two major themes: technology and community. As part of this space, Unbox create the Banyan Tree, a spatial installation for people to congregate under to share thoughts, build projects and collectively explore the future of a connected village. Supported by Mozilla Festival, an annual celebration of the open web. The world of the future seems to be a smart, fast, connected digital world and it is easy to get seduced by the potential it promises. There is a lot of hype around data-driven futures that will make everything, including our relationships with each other and the places that we live in, smarter and more efficient. However it is also important to focus on our shared humanity and the diversity of our complex lived experiences in our conversations about the future. How can we find expression and meaning in a world shaped by technology, data and algorithms? How can we think of technology that can manifest our shared culture and values that are also unique to place and context? How can we be educated participants in our own future? On November 18th, 2017, UnBox brought a day-long, multi-format event to Bangalore to explore these questions and to start conversations about the role of technology in our society, and about how we want to navigate being human in a digital world. Divers experts hosted workshops and panel discussions, while design students showcased their work in an exhibition. The event was in partnership with Mozilla’s Open IoT Studio, Design Academy Eindhoven, and Lowe’s Innovation Labs. UnBox collaborated with the Government of India’s Department of Biotechnology, Ministry of Science and Technology, to design an EdTech Lab in order to kickstart a long-term collaboration between India and Finland in the space of education technology and gaming. The 4-day event at C-CAMP in Bangalore brought together participants from both countries to leverage Finnish technology and experience in education to ‘Reboot Indian Schools’. The event was funded by the Governmet of India and was attended by various participants from the two countries including educators, organisations working in the edtech and edugaming space, funding agencies and representation from the two governments. The first part of the event was geared towards getting to know the Indian context and understanding different participating organisations and people better. With representatives from the government and industry experts in the same room, debates were sparked around the ethics of education and what are the challenges with technology in a country like India. Live demonstrations of games, and experiences helped in better understanding existing products and their relevance in the Indian market. The latter part of the event focused on testing out products and services in Indian schools. In partnership with the Atal Tinkering Labs, Finnish products and services were tested across 10 schools in Bangalore. End users, students, teachers, principals not only tested these products but also became active participants by co-creatoring games and tools for learning. Quicksand and fellow REACH Network partner studios Apogee and STBY led a hands-on exploratory workshop on the theory and practice of design research and thinking under the UnBox umbrella. This marked another step in the evolution of UnBox from a stand-alone festival to a platform for collaboration. This day-long workshop elucidated for participants how design research can provide new ways of evaluating their personal as well as organizational work, and inculcated an understanding of what individuals can do to change how they and their organizations work. Targeted at a diverse group of professionals and students, the objective was to familiarise participants with some of the approaches and tools that can assist in applying design methods in their work and studies. The workshop encouraged participants to find a personal resonance with design research through re-examining their unique challenges both personally and in a group setting in a curated masterclass, where they encountered design thinking methods, case studies, and processes. The workshop was hosted by UnBox and held at Numa Bengaluru Events Space. 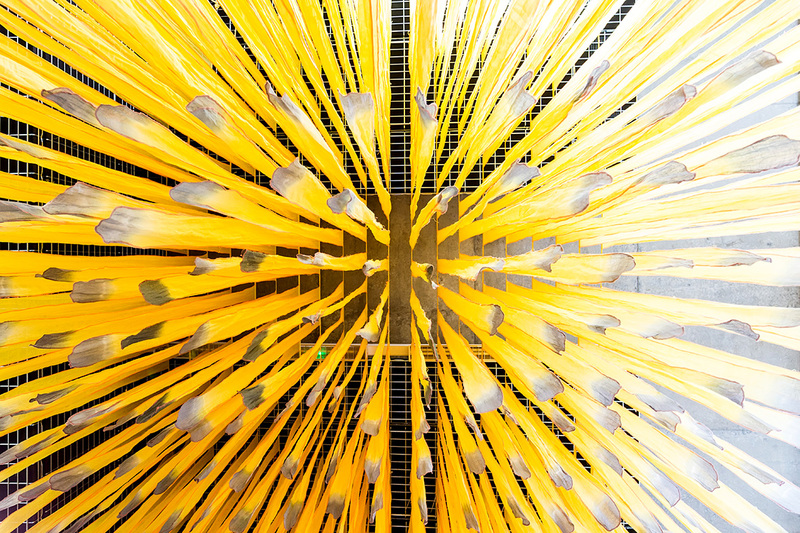 The Strategy World Tour led by IIT Institute of Design is a behind-the-scenes look at the work of leaders in highly innovative organizations, both large and small, in five of the world's centers of change. This is a lead up to the Design Strategy Conference in May 2016 that seeks to identify insights from emerging trends and behaviours observed by selected participant groups across San Francisco, Hong Kong, Mumbai and Detroit. Ayush and Babitha represented UnBox in the Hong Kong leg of the tour, which sought to learn from technology start-ups and large firms in Hong Kong and Shenzhen. The tour visited hacker spaces, large technology firms, innovative design incubation spaces and technical teaching setups, with an emphasis on the changing nature of business and manufacturing accelerated by technology in the new economy. UnBox will also collaborate with the Strategy World Tour for the upcoming visit to Mumbai in February 2016. Details here. In an effort to share and bring together our partners and friends in the UK, UnBox hosted a PopUp event in London on June 25, 2015 with the support of AHRC. The PopUp featured a roundtable with invited partners, followed by a public event- showcasing selected UnBox LABS & Fellowships projects. The roundtable in London sought to bring together diverse partners, from across UK universities and institutions, to collectively deliberate on themes and formats that could be meaningful for future India-UK partnerships via the UnBox platform. Using a preliminary exercise whereby we mapped emerging trends across Indian’s cultural and social landscape, and used it as a provocation, the roundtable sought to elicit debate and discussion from all partners and seek inputs on how UnBox could further facilitate this exchange. Moderated by John Thackara from the Doors of Perception, the roundtable began with UnBox welcoming partners and collectively exploring why multidisciplinarity was important and how and why we were each contemplating collaborations. We also brought together different perspectives on the opportunities for themes, formats and platforms for Indo-UK collaborations. The London PopUp was in partnership with the Arts & Humanities Research Council, UK. The British Council and Watershed's Blurring the Lines exhibition was about culture in flux, told through sixteen stories of people who dare to see the world differently. Babitha George, one of the UnBox co-founders was featured in this exhibition as one of the sixteen who are navigating changes and opening up ideas, communities and platforms to reimagine our collective futures. UnBox was invited to talk about the experience of creating collaborative platforms through the festival and lab at Central Saint Martins as part of the Public and Collaborative Lecture Series organized by Design for Social Innovation and Sustainability (DESIS). UnBox co-founder Babitha George presented glimpses from previous editions of the festival and talked about the motivation behind starting an inter-disciplinary, cross-cultural collaborative platform like UnBox in India, as well as some of the challenges and anxieties that are imperative in attempting to put something like this together. As a follow up to the UnBox LABS 2014 held at the National Institute of Design 2014, a panel discussion on the cities of the future was held at the Alchemy festival at the Southbank Centre in London. At the discussion, Babitha George co-founder of UnBox talked about the projects incubated at the lab and the need for more cross-cultural, inter-disciplinary collaborations to even attempt to address the complex challenges that urbanisation is throwing up around the world. In addition to the panel, an exhibition at the Southbank Centre showcased the process and projects that had emerged from the lab, while also providing an open invitiation to the audience at Southbank Centre to share thoughts on what they'd like their city of the future to look like. Alchemy is the Southbank Centre's annual festival showcasing the best of music, dance, literature, comedy, fashion, art and design from the UK and South Asia. The five fellowship projects that evolved from the 2013 UnBox Fellowships were showcased at the Alchemy festival at the Southbank Centre London. 15 creative practitioners and researchers from the UK and India worked with five organizations in India over a month to look at collaborative solutions that included an online game connecting urban consumers to rural agricultural practices, a multimedia collection of narratives around a heritage site, a multi-layered creative mapping project using a local Goan market in Goa as its focal point and others. Neha Singh, one of the co-founders of UnBox, put together the exhibition at Alchemy. The showcase at Alchemy also included small workshops and activities with the fellowship groups.